I used to think poets were high brow types. People who would look down their noses at me with disdain. I don’t think that anymore. 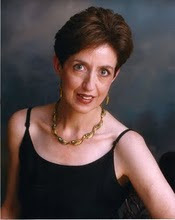 Getting to know Maureen Doallas and other gifted poets and writers through blogs and twitter has been much fun for me. Because much to my surprise and delight, they’re very down to earth and just a little on the crazy side. Which, in my book, is a very redeeming quality. This is the time of year when some seriously, and many not, set about making resolutions, stating their intentions to do something, accomplish something, during the coming new year: perhaps learn a new language, volunteer at a local shelter, be kinder, try harder, make amends to someone. This is a story that doesn’t need that kind of resolution. It’s about a beginning following an ending that failed to happen. The story begins where he starts: by making fun of himself in front of people who go to a comedy club for drinks and maybe a good laugh, if he’s having a good night. Giving them all he’s got is just his way of getting the obvious out of the way. What’s obvious he acquired in 2007, some place in Iraq we won’t ever be. What’s obvious is his face, a tracery, a pattern of lines pieced together like a collage, the only kind of art his doctors could make when the U.S. Army convoy truck he was driving lumbered too near an unseen roadside bomb. His face is a map of hope. It reflects what’s worth having the intention to do, which is to live, to give back and not up. 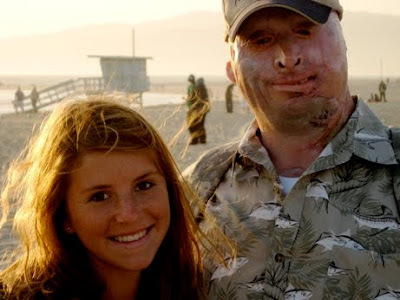 His burn scar covers most of his face and head. His ears are missing a few pieces. His left eye doesn’t open well because of scar tissue. He could be described as bald but for the few hairs that still grow in place. He gave up his left hand and forearm below the elbow. His body took a lot of fire. Because the bomb happened, his body gave up a lot. What he didn’t give up was his self, which found a way to turn what might have been an ending into an awareness of what can be learned when a person finds and uses the strength to drive on. The ending that we know happens over there never did in his case. Staff Sgt. Robert Henline didn’t die of wounds received in Operation Iraqi Freedom. There is no marker in any military cemetery bearing his name and rank and the year of his birth and death. Instead of dying, Bobby Henline lived and began telling jokes. He started during his months of recovery in the burn unit at Brooke Army Medical Center, in San Antonio, Texas. He kept going through dozens of surgeries and many months more of physical therapy — the kind none of us can imagine taking for 15 minutes, let alone days at a stretch. Of course; haven’t you ever made fun of the way you looked? And gotten a laugh, too? The club is where laughs help heal invisible wounds whose pain is let out in the words that reverberate through a microphone. It’s different from Army gigs, no doubt, but it’s a place to practice a new kind of occupation. It’s a place for focusing on a new routine that offers a way to get past the result of an ending that never happened. It’s a place where we learn, even while we’re laughing, that a negative can be positive, too. Henline, like the men I wrote about who create art from their uniforms, shows us that stuff happens and life goes on, that hope and strength and something ineffable can be brought from the inside out and make a difference. The difference Henline is making doesn’t take a New Year’s resolution. Or need one. Purple Heart recipient Robert Henline, age 38, is married and has three children. This post is inspired by visits to Henline’s MySpace Page and his blog, which is accessible there. You will find many pictures of Henline on that MySpace page. Henline is the subject of numerous profiles, including a series of interviews with NPR, as well as OperationHomeFrontOnline, Texas Public Radio, and MySA Military. To read more from Maureen, please visit her at Writing Without Paper and follow her on twitter at @Doallas.